Adobe® Flash Professional® CC provides an authoring environment for creating animation and multimedia content for the Web, enabling visual designers to build interactive experiences that present consistently across desktops and mobile devices. Continue reading for a quick introduction to new features available with the latest update to Flash Professional CC, and links to other resources that provide more information. Adobe Flash Professional CC update for December 2013 is now available. The update fixes to some critical bugs. Adobe recommends that you install the update. Adobe Flash Professional CC update for November 2013 is now available. The latest update enables you to natively author and publish HTML5 Canvas content. The update also contains bug fixes. With its latest update, Flash Professional CC empowers the open web ecosystem by providing native support for HTML5. You can now natively author and publish HTML5 Canvas content from within Flash Pro. The latest update to Flash Professional adds a new HTML5 Canvas document type that contains preset document and publish settings. You can work with the familiar Timeline, Workspace, Tools, and other functionalities of Flash Pro, but produce HTML5 content. Flash Pro CC allows you to automatically transition and port existing ActionScript 3.0 content to an HTML5 Canvas document using the Convert AS3 to HTML5 Canvas command. For more information, see Creating and publishing an HTML5 Canvas document. The HTML5 Canvas document uses CreateJS libraries when publishing HTML5 content, and hence, Toolkit for CreateJS will not be available as an extension, henceforth. Usability enhancements to Swatches panel. You can now add folders and swatch groups there by building a hierarchy of color themes. Auto-formatting of code within Actions Panel. Ability to add icons for mobile applications in the descriptor file. New JSAPIs for Tween and SpriteSheet Exporter objects. AIR: You can include AIR 3.9 SDK using Manage AIR SDK option, which lends support for iOS Simulator 7.0. The June 2013 release offers a completely refreshed Flash Professional CC application with modular 64-bit architecture, streamlined user interface, and powerful new features. It’s also a native Cocoa application, ensuring future compatibility with Mac OS X. This comprehensive refactoring brings in dramatic improvements to performance, reliability, and usability. A key improvement available with Flash Professional CC is the huge boost to Performance. From simplifying complex workflows to fixing critical bugs, Flash Pro has been put through several important changes. These changes bring in dramatic improvements to performance across all supported platforms. Flash Professional CC has been enhanced to support HiDPI displays including Retina Display available on the new MacBook Pro. HiDPI display facilitates a dramatic improvement in image fidelity and resolution. With Flash Professional CS6, that was not native to HiDPI display, the text was not as sharp and images did not have much detailing. The increased resolution of these display types required the Flash Professional user interface to be refreshed completely. And also ensure that the content is displayed with appropriate levels of fidelity. The Flash Professional CC user interface is now displayed with superior clarity and visual crispness. It includes icons, font, drawing on stage, general content rendering, and the whole IDE itself. By default, Flash Professional CC enables HiDPI display on MAC. However, you could turn off retina display on MAC, and Flash Professional CC replicates this change. The Keyboard Shortcuts panel has been redesigned and streamlined to facilitate improved usability and performance. (A) The Keyboard Shortcuts panel is now equipped with a Search facility that allows you to drill down to the right Command, easily. (B) You can also copy the entire list of Keyboard Shortcuts to the clipboard and then, to a text editor for quick reference. (C) In a conflict, when setting a keyboard shortcut for a command, a warning message is displayed. And you can quickly navigate to the conflicting command, modify it to resolve the conflict. (D) You can modify a set of shortcuts and save them as a preset. You can then select and use the preset per your convenience. For more information, see this Keyboard Shortcuts. The Preferences panel is now fully revamped, and has dramatic improvements from a usability standpoint. Several options that were sparsely used have now been removed. These options not only affected usability, but also hindered performance. The changes also helps improve the workflow with Creative Cloud when Syncing Preferences. Actions Panel and ActionScript File editor have been docked under a single window. Code Commenting feature can now intelligently comment or uncomment based on your selection of single or multiple lines of code. Scintilla, an open source code editing component, has now been integrated with Flash Pro. The following enhancements have been made to the Find/Replace functionality. The user interface of the Find/Replace dialog has been significantly improved to enhance usability. Note: Find/Replace dialog is available within Actions Panel. Flash Professional CC introduces several key features and enhancements aimed at improving workflow efficiency for designers and animators. These features help simplify and quicken several common tasks that were tedious and time-consuming to perform earlier. When working with innumerable objects on the Stage, a structured approach to setting up the Timeline is important. These enhancements allow you to organize layers, objects, and the Timeline to help improve time and work efficiency when designing. The Flash Pro user interface has also been redesigned to bring in remarkable changes to the appearance. 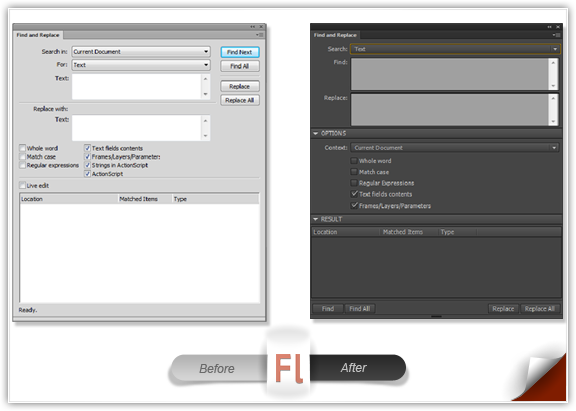 The restyled user interface of Flash Pro is available in dark and light themes. The dark user interface allows you to preserve more focus on the Stage, instead of various Tools and menu items, when designing. The Distribute to keyframes option allows you to distribute multiple objects on a layer to different keyframes each. You can quickly create frame-by-frame animations, by distributing multiple symbols or bitmaps to individual keyframes. Then, the animation is created when these frames are played in a sequence. You can observe the effect by scrubbing the playhead on the Timeline. 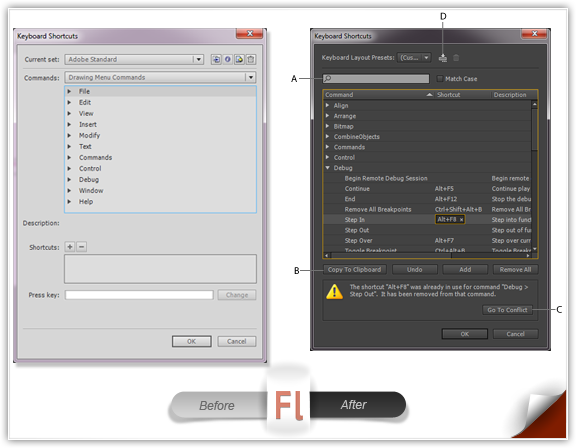 For more information, see Creating tweened animations by distributing objects to Keyframes or Distribute to keyframes. The Swap Symbol/Bitmap option allows you to swap symbols and bitmaps. When working with numerable objects on the stage, this option allows you to quickly duplicate symbols/bitmaps. On swapping, Flash Pro also preserves properties applied to the original symbol/bitmap. For more details, see Swapping Multiple Symbols and Swapping Multiple Bitmaps. The Flash Professional CC Timeline includes options to select multiple layers as Guide or Mask layer types. The new options allow you to organize and manage your layers and objects more efficiently. For more information about Guide or Mask layers, see Timeline Layers and Using Mask Layers articles. Flash Professional CC allows you to modify properties of multiple layers at once. From Layer Type to Outline Colors, you can modify settings applicable to all selected layers. When working with multiple layers, it is tedious to explicitly select and apply Properties to each layer. Use this feature to apply commonly applicable Properties across multiple layers at once. This key enhancement not only helps save time, but also improves efficiency by simplifying an otherwise tedious process. For more information, see Setting Properties to Multiple Layers. Flash Pro CC allows you to proportionally expand or contract Timeline ranges. Using Keyboard shortcuts (Ctrl+Drag on Windows and Command+Drag on MAC) you can move the range markers on either sides of the playhead proportionally. You can also move the Loop range across the Timeline to any desired position. Earlier one had to drag both range markers in order to move the range. With Flash Pro CC, you can hold the Shift key and drag the range using either of the markers across the Timeline. Flash Pro CC preserves context of the main and nested Timelines when working with scenes, editing symbols, et cetera. The playhead position is maintained for the main as well as nested timelines, providing the necessary context per the frame you previously worked on. Flash Professional CC allows you to work in the full-screen mode. Switching to the full-screen mode allocates more screen space for the stage by hiding panels and menu items. The panels are converted in to overlay panels, and can be accessed by hovering the pointer over the sides of the screen. To enter full-screen mode, press F11 on Windows or Ctrl+Cmd+F on MAC. When working on a large workspace, you can scroll to certain corners of the stage that you want to focus on. In such cases, scrolling back to the center of the stage is cumbersome. Center the Stage option in Flash Professional CC resolves this particular problem. At any point in time, you can use Center the Stage option to quickly switch to the center of the stage. In Flash Professional CC, go to View > Magnification > Center the Stage to switch to the center of the stage. Or, you could use the Ctrl + 0 (Command + 0 on MAC) keyboard shortcut to enable this option. Alternatively, you could click the button beside the magnification selection drop-down. The PSD and AI file import workflows are now faster, more efficient, and streamlined. The import dialogs have been modified to provide a simple experience. 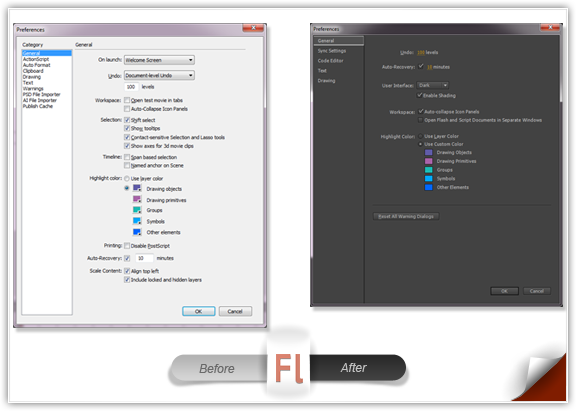 With erstwhile versions of Flash Pro, the workflow facilitated did not support modification of Layer properties in bulk. The new approach allows you to modify or set Properties for several layers at one go. Layer Panel View has been excluded. Hidden layers bundled in to a Layer Comp stay hidden. Flash Pro CC allows you to preview a shape along with the selected color when drawing on the Stage. With erstwhile versions of Flash Pro only the outlines of the shape were visible. With Flash Pro CC, the Live Preview enhancement displays the Stroke and Fill Color of a shape along with the outline. Additionally, when you choose different Stroke or Fill colors for a shape, Flash Pro CC displays a live preview of the color on the Shape. To see the live preview of colors, ensure that you select the shape on Stage, and hover the pointer over any color. Flash Professional CC allows you to affix Flash assets to pre-defined anchor points on the stage while scaling Stage Size. On the Properties Panel, click the button within the Properties frame (next to the Size field) to bring up the Document Settings dialog. Resize the stage using by altering the Stage Size values. You cannot assign Anchor Point to your Flash asset without resizing the stage. Select the Scale Content option. Choose an appropriate Anchor Point where you want to position your content. Go to Edit > Preferences > General. Select Dark or Light color themes from the User Interface drop-down. The Export Video workflow has been remodeled to facilitate smoother and a more seamless experience. Flash Pro deviates from the erstwhile export video behavior, where it only exports QuickTime (MOV) files. Flash Pro is now fully integrated with Adobe Media Encoder. And it is this integration that is leveraged to convert MOV files to various other formats. For more information, see Exporting Video with Flash Professional CC. For more information, see Using the Flash Professional Toolkit for CreateJS article. Flash Pro CC introduces new features to enhance the AIR application development workflow for iOS devices. These features leverage important updates to the AIR library to add powerful capabilities to Flash Professional. You can test and deploy AIR applications on multiple devices at once. This time-efficient approach to testing and deploying applications allows you to test applications across devices of varying screen sizes - all at once. Ensure that you connect your devices via USB to leverage this feature. For more information, see Multi-device Connectivity via USB. The Interpreter Mode allows you to quickly test and debug your applications written for iOS devices. In the Interpreter Mode, AIR applications are installed (on the target iOS devices) by bypassing the need to convert ActionScript code to ARM. Using the Interpreter Mode is not only time efficient, but also simplifies the application deployment process. For more information, see Test and debug using Interpreter Mode. Flash Pro CC allows you to test and debug applications on iOS devices tethered via USB. This feature adds on the remote testing and debugging functionality via Wi-Fi available with Flash Professional. However, by tethering devices via USB, testing, and debugging workflows are simplified by reducing the number of manual steps. In effect, it expedites the testing and debugging processes for applications targeting iOS devices. For more information, see Testing and debugging on iOS via USB. Flash Professional CC can now leverage the advanced telemetry features provided by Adobe Scout. This feature allows you to retrieve and use the intuitively collated profiling data provided by Scout. Scout is an analysis and profiling tool for Flash runtime that allows you to optimize mobile, desktop, or web applications. Scout is designed to provide accurate data aggregated from several system resources. The data provided by Scout is intuitive enough to easily measure, profile, and analyze performance of applications. Scout provides basic telemetry data for SWFs running on a computer. To enable and view advanced data, Flash Professional provides options on the publish settings dialog. To integrate Flash Professional CC with Scout, install Scout on the same computer that has Flash Professional CC installed. You could also install Adobe Scout on a different system, and use the Remote Logging functionality, to access telemetry data of SWFs running on a different system. For more information, see Using Flash Professional CC with Adobe Scout. The error messages for JS APIs were found to be unhelpful and they have been improved significantly to include contextual data. The error messages now contain line number, problem statement with exact error message, filenames, and more such details that help improve the debugging experience. See the system requirements for Adobe Flash Professional CC at http://www.adobe.com/products/flash/tech-specs.html.